Sugar production in Cuba during the 20th century has never been curtailed by the installed industrial capacity. It is easy to increase the cane grinding rate on a short notice in such a manner as to process any expansion of the cane supply within the normal harvesting season. The communist government was fortunate the mills it seized had an industrial capacity to crush all the cane it has made available up to the present date. In contrast, augmenting cane quantity takes years from planting to harvesting, with weather vagaries ever present. In certain years, for example in 1930-40 and 1953-60, international marketing agreements set export quotas for Cuban sugar. After 1960, the Communist regime pulled out from, or discarded, quota pacts and Cuba has been producing sugar freely, limited only by the available cane. We estimate that in Cuba— before Castro— the cost of growing and delivering cane to the mill amounted to 58% of the total sugar production cost, whereas the processing of cane into sugar by the mill represented 27%, for a ratio of 2.14 (58/27). 1 Thus cane cost within the total production cost carries a heavier weight than the industrial cost. Furthermore, the mill processing cost among countries shows a small deviation from the international average cost, a consequence of the machinery being very much alike in all countries. On the other hand, the cane cost is subject to wide swings throughout the various nations, the upshot of the diverse characteristics of soils, climate and labor. We raise these points because customarily most of the attention of seminars is devoted to the factory equipment, perhaps because it is easier to deal with machinery than with agriculture with its myriad facets and uncertainties. The prime objective of Cuba’s communist government is to stay in power, regardless of consequences. Accordingly, every aspect of the governmental structure and its derivatives, like the sugar industry, has been designed to keep absolute control of all activities in the hands of Communist Party members. The top executive in every mill is the Communist Party Secretary of the Mill Nucleus. All projects and decisions must be cleared with him. He has authority to overrule technicians in every matter including technical advice. His superior is the Communist Party Secretary of the Region. In 1993, Juan Herrera, an engineer and a competent sugar technologist, was replaced as Minister of the Sugar Industry by Nelson Torres, a civil engineer, chief of the Communist Party of the Province of Cienfuegos, with no sugar experience. The pernicious effects of the communist system on the functioning of the sugar industry and its workers in Cuba will be pointed out in the course of this report. Our data on the industrial sector comes mostly from Cuban technicians who have worked in high positions in the industry, some of them of recent arrival in Miami. Their information is much better, in greater detail, than the news reaching us through the media. Their names have been omitted in this report in order to avoid reprisals to their relatives in Cuba. The latest statistics published by the Cuban Government on the sugar industry pertained to the 1988-89 crop. Even these were incomplete and of questionable reliability in some cases. Everything in Cuba is subject to unpredictable, whimsical changes that take time to reach us. Thus, some of our data might not be current. Systems and Patterns in the Industrial Sector With the onset of communist control in 1961, many new systems and patterns emerged in the industrial sector that seriously impaired its efficiency. Later on, the economic crisis unleashed by the demise in 1990-92 of Communism in Europe and the suspension in 1992 of the subsidy by the Soviet Union to Cuban sugar, forced mills to operate with a reduced budget which translated into smaller cane deliveries. The effect on the performance of the factory may be termed deleterious. An outline of problems and practices found in the industrial sector in the 1995/96 crop follows. Cane Crushing: A striking characteristic is the intermittent crushing of all mills, which plays havoc with the entire process of juice extraction and the heat balance of the factory. Insufficient cane delivery is the main cause of interruptions, followed by machinery breakdowns and rains. Deficient cane deliveries stem from the lack of coordination of cane harvesting and/or transportation from canefield to mill. The cane shortfall may result from insufficient cane ready for harvesting, or cane harvesting machine breakdowns, or a labor shortage. Transportation equipment, nowadays mainly trucks, with their steep depreciation, are prone to be taken out of service on account of breakdowns and lack of spare parts. Statistics of the vital parameters for assessing the performance of cane grinding (e.g., percent sucrose extraction, cane sucrose, percent sucrose, percent sucrose and moisture of bagasse) have not been published. Needless to say, a mill with frequent stoppages is bound to show a low extraction and outside fuel (Bunker C) will have to be burned for processing the sugar containing products (cane juice, syrup, molasses, massecuites) filling the boiling house (clarifiers, evaporators, syrup and molasses tanks, vacuum pans, crystallizers). Once crushing stops, any stored surplus bagasse will be promptly used up and outside energy will have to be called upon for the quick processing of the sugar containing products in order to avoid their loss through fermentation. The capacity of the transformer substations connecting the public power grid to mills have been increased manifold. Through this channel, outside electric power supplements the energy demand in shutdowns for driving injection and vacuum pumps for condensers, and centrifuges. No precise figures on the energy cost during stoppages are available, but undoubtedly the cost is a high one. A weird mitigation of the energy shortage occurred at the Vertientes Sugar Mill in 1995. Wagons with stale cane, unsuitable for sugar production, were set aside at a railroad spur. When a large number of wagons had accumulated and the mill shut down in one of its frequent stoppages, the stale cane was discharged in the cane conveyor and crushed as regular cane, the only difference being that the fermented juice thus extracted was discarded down the drain while the mill got the benefit of storing its bagasse for future energy requirements. The question arises, how is this 43.53% unused capacity allocated? This matter first came up in the 1992/93 crop, when sugar output plunged to 4,245,716 MT from 7,218,804 MT in the previous year. First, in late April 1993, the government declared that for the 1992/93 campaign, 5 out of the 20 mills in Northern Villaclara Province (25%) had not operated. 3 Extrapolating 25% to the total number of mills in the country (157) yields an estimate of 39 idle mills. This method checked for Matanzas Province; for the rest of the country we could not get the data. Shortening (or token) grinding of many mills. Many mills operating a few days (5 days, 15 days, ). The conclusion, shared by people from sugar mill localities, is that the regime is frantically trying to keep all mills mobilized for the purpose of its image, offering hope for the future. The government does not want ghost towns. In view of the acute economic crisis and the surplus capacity available, dismantling and/or cannibalization of existing mills provides a temptation for a quick, albeit irreversible remedy. As far as we know, the government has not, to this date, resorted to said systems in a large scale. The sugar factories seized by the communist takeover in Cuba comprised the best machinery inventory in the world’s sugar industry at the time, notwithstanding statements to the contrary by some experts lacking operational knowledge. 4 No other country could compete with Cuba, in crushing capacity, efficiency and product quality. Capacity increment over 1952: 32%. Centrifuges (for separation of sugar and molasses) “A” and “B” sugar (batch centrifuges): All belt driven centrifuges replaced by automatic, electrically driven batch centrifuges. Manufacturer: ASEA (Sweden), Silver Brand, excellent quality, comparable to U.S.
Centrifuges for “C” sugar (low grade sugar): Continuous centrifuges, electrically driven, have displaced the batch centrifuge for “C” Its power consumption is much lower, needs no labor, cheaper; a continuous centrifuge will perform the task of several batch centrifuges. Installation of continuous centrifuges for “C” sugar in all mills, fully automatic. Manufacturer: foundry at Unión de Reyes from imported materials. Electric motors imported from Poland. Capacity increment over 1952: 35%. All mills converted to bulk raw sugar shipments, at mill (handling and warehousing), transportation from mill to port, and vessel loading. Railroad wagons and truck vans for bulk sugar locally built. Sizeable savings in packing (formerly jute bags) and labor at mill and port loading. About 40% of total factory workers eliminated (bag numbering, packers, sewers, cart workers), stevedoring (stacking at warehouse, railroad wagon or truck loading), centrifuge operators. It should be noted, however, that the bloated personnel in other departments more than offset the labor savings of bulk sugar. No laboratory reports are available regarding the quality of sugar for individual mills or for the entire industry. Said data has been declared confidential by the regime and its disclosure would bring a severe penalty. Thus, we have to glean available production statistics and accounts by technicians from inside Cuba for an assessment of the work of the Boiling House, however unreliable these reports might be. The missing indicators of Boiling House efficiency include analysis of cane juice entering Boiling House, analysis of sugar produced, analysis of final molasses, and analysis of mud filter cake. Available statistics are cane ground (until 1989), sugar produced (up to 1996), yield of sugar 96° polarization (until 1989), and final molasses produced (up to 1996). According to Anuario Estadñstico de Cuba (Statistical Yearbook of Cuba), 1988, printed by the Cuban Government, for the 1985/86 crop, the yield of sugar 96° polarization, was 10.59%. Meanwhile, in 1952, the corresponding yield was 12.46% and the 1952-58 average was 12.79%. Evidently the sugar yield % cane in the communist period has fallen by around 17.20% compared to the 1952-58 period, at a time when said yield has been rising in most nations as an outgrowth of sweeter cane varieties being developed and improvement in the mill machinery. At first glance, the overall performance of a Cuban mill with 10.59% sugar yield is a dismal one. The fault, however, rests to a large extent on the low quality of the cane delivered to the mill, received several days after harvesting, with a high trash percentage, plus the numerous interruptions of grinding. Lacking the juice analysis we are unable to determine the Boiling House Efficiency. Before Castro, Cuban sugar set the norm for sugar quality. Nowadays, Cuban raw sugar is an inferior quality product unwanted/depreciated in sugar refining countries. In Venezuela, for example, in 1989 some refiners refused to refine imported Cuban raws due to their bad quality. A complaint by the Venezuelan Government (the raws importer) to Cuba was settled by Cuba accepting to supply some 2,000 MT raws free as compensation. The reason for the low quality of the raws was presumably poor quality cane juice and, very likely, the low technical level of the Cuban mill personnel as explained above. Cogeneration of electric power for sale to public utilities, as in Florida, Guatemala, etc. Boilers at 600 p.s.i. are needed to do this, instead of regular 150 p.s.i. Eight new mills built with medium size tandem rollers (7 foot-wide rollers rather than 9 foot-wide). Shortly after consolidating its control of the labor unions (1961), the Cuban communist government enacted a decree freezing wages in all industries, up to the present. The only exception in the sugar industry was the minimum agricultural wage of 3.15 pesos daily, which was raised to 4.00 pesos. A ceiling of 10 pesos daily (300 pesos per month) was set. Historical (old) wages were respected. but promotions must abide by new nomenclature with lower wages. In pre-Castro time, the salaries of sugar workers were regulated by an escalator clause linked to the price of sugar in international markets. In 1958, the world market sugar price was $0.0496/lb F.O.B. Cuban port; currently it is $0.1260/lb FOB. The differential between wages at the international sugar price (Contract No. 11, New York Sugar Exchange) and the frozen wages at $0.0496/lb has proven to be a bountiful source of revenues for the regime, at the expense of workers’ economy. Minimum daily wages in 1996 with the hypothetical wage (in U.S. dollars) that Cuban sugar workers would have earned based on the wage they earned in 1958 and the international market price escalator. The hypothetical wage was 52 times higher than the actual wage for agricultural workers, and 84 times higher for industrial workers. 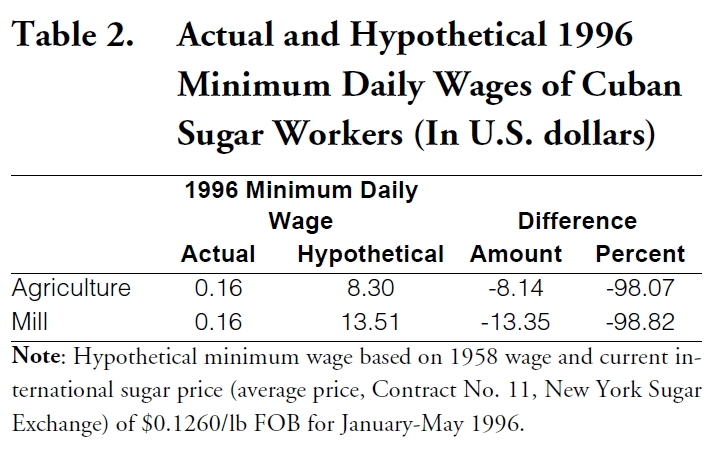 These two tables show clearly the blatant exploitation inflicted on sugar workers by the regime. According to our calculations, in the 20-year interval 1972-91, with average international sugar price at $0.2423/lb FOB, and using a exchange rate of 1 peso=$1, the wage differential amounted to $31.0 billion, which was retained by the government. 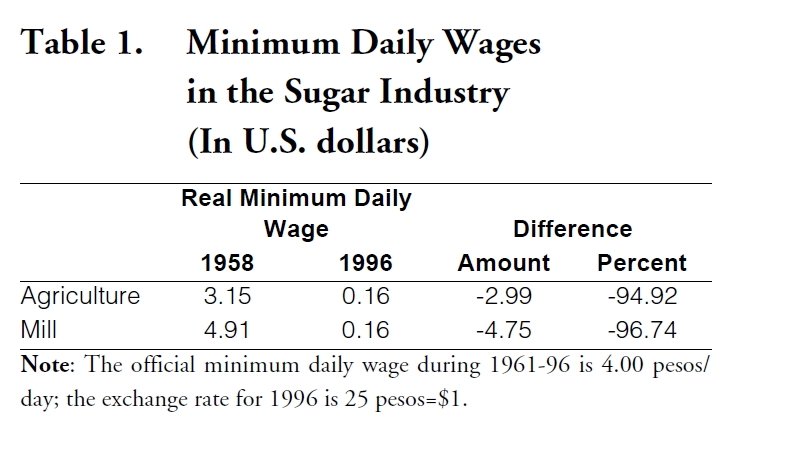 5 For the five-year period 1992-96, the average international sugar price was $0.1083/lb FOB; using an exchange rate of 85.38 pesos=$1, the wage differential has amounted to $2.7 billion, 6 which has also been pocketed by the government. Such deprivation of sugar workers of their hard-won remuneration has made them despondent to work. At the present exchange rate of 25.00 pesos=$1, the minimum salary of 4.00 pesos daily is equivalent to $0.16, and the monthly minimum salary of 120 pesos to $4.80; the maximum daily salary of 10 pesos is equivalent to $0.40, and the maximum monthly salary of 300 pesos is equivalent to $12.00. Many months no cooking oil/fat is available. No meat is available through the ration book, although some off-quality meat mixed with soybean, inedible to many, is distributed irregularly. Rationed goods last a person 12-13 days. After that every individual is on his/her own. The prices of rationed goods are subsidized. Prices in the black market are dollarized and too high for workers earning Cuban pesos. Workers loaf at the work place, due to lack of incentive, dissatisfied with a miserable salary. There is an absence of discipline, high absenteeism, and management has lost authority. Management is aware of the harmful situation, but reluctant to enforce order out of fear of upheaval. Personnel: Many new, unnecessary jobs have been created in the sugar industry of a bureaucratic nature. In the Tinguaro Sugar Mill (5,700 MTCD), for example, there are 5 additional engineers and 1 boiler technician who do not participate in the mill’s operations. There are currently 3 shifts in the machine shop (compared to a single shift before) with 8 mechanics each (compared to one mechanic per shift before). In 1981, the government enacted a decree establishing at the mill factory, during the crushing season, 4 shifts instead of the existing 3. 7 Its implementation was delayed until the early 1990’s. This measure increases the factory payroll by 33%. Cuba can still muster the basic industrial capacity for processing 7.0-8.0 million MT sugar/year. The government has kept the existing 157 mills in operational condition despite the surplus capacity for the current 4.5 million MT sugar/year production. The lack of proper maintenance since 1992 has caused a marked deterioration of the machinery, although the damage could yet be redressed if abundant funds become available. Cannibalization has started in some mills but still is not widespread. Management is in the hands of Party politicians, not technicians. Performance is at a low level. Work ethic, morale and organizational efficiency are in absolute disarray. The low sugar yield ratio of 10.59% is shameful. The blame falls mainly on the poor quality of the raw material (cane) and frequent stoppages due to deficient cane deliveries. On the other hand, the incompetence of management and personnel in key positions aggravates problems. Overall, the sugar factory performance under Communism gets very low marks as contrasted with the top ranking of prerevolutionary Cuba. The industrial sector was capable of processing the available cane supply to produce 4.5 million MT of sugar and could conceivably do it for a much larger crop if the machinery receives proper maintenance. Currently Cuba’s production is limited by the available cane and it seems it will remain so in the near future. The overall performance of the whole Cuban sugar industry is a dismal one in agriculture and in industry. It is likely to continue in wretched conditions — even with sufficient funds— while its management and organizational structure pursue Communist political objectives as their primary function. The infusion of funds through the foreign financing of inputs in the current crop appears to have had a beneficial effect on cane output. It remains to be seen whether the improvement can be sustained. Large scale shortchanging of workers’ salaries and repression continue, along with workers’ resentment and despondency, while harsh Communist measures are in effect.